In honor of the fact that an exclusive Lilly Pulitzer collection is coming to Target, my blogging bestie Michaela (from the Monogrammed Midwesterner) and I have decided to host a link-up in honor of this! The "Lilly for Target" link-up for fellow pink and green lovin' fashionistas will be held on Wednesday, April 29th, which is 10 days after the items launch. This will give everyone enough time to shop at their local Targets (or to order online! ), and have time to style their items. The only rule for entering this link-up is that you must be wearing something from the Lilly for Target collection! Michaela and I hope that you will join us! We ask that if you do participate that you will use the hashtag #LillyForTargetLinkUp in your social media posts, and that you will include a link to both my blog and Michaela's blogs in your post (and follow both of our blogs as well!). Fast forward to early April 2015. Michaela has now officially hit "blog bestie" status in my life. Seriously- I love this girl!! 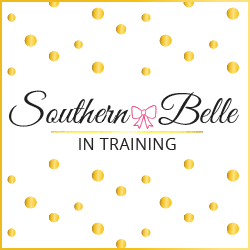 I am just so sad that she is a "Monogrammed Midwesterner" and I am a "Southern Belle in Training" (and also a New Englander in the summers still).... clearly geography isn't our friend as we haven't not been able to meet in person! But we are Facebook friends and a stream of late-night Facebook messages turned into texting each other almost daily, about both blogging and non-blogging related things! I still can't believe it- seven months apart, we both wore the same Lilly dress for our 20th birthdays! And this is after we had already been talking about hosting the Lilly for Target link-up. :-) I think Michaela styled the dress absolutely beautifully, and I can't think of anyone else that I would have rather seen in this gorgeous dress for their 20th birthday! What are you all up to this weekend? Let me know in the comments! So exciting! I definitely think I will do a post for your link up! How funny that y'all both wore the same dress for your twentieth birthdays! That is such a sweet story!! I swear meeting all sorts of great girls (like you!) has to be my favorite part of blogging. If I can get my hands on something in the collection I will definitely have to join y'all for the link up! What a sweet story! This link up is perfect, I'm looking for some easy post ideas for the next couple of weeks! I think I will definitely be able to participate in this linkup considering I will be blowing all my money at Target come Sunday. What a sweet story! My best friend and I became besties because we had the same purse! I am hoping to participate in the link up if I can get my hands on the Lilly! I have no idea what it will be like at my Target. Such a cute story! And I can't wait to see your posts from the new Lilly collection. Love this story! I've met my best of friends via blogging. It's an amazing thing! That is so funny that you both had the same dress! How crazy!! I'm so excited for the Lilly for Target launch. Hopefully I'll get my hands on a few pieces and join the link up! Go Target! Can't wait to see what will be different for Lilly for Target. I hope that they push boundaries! I had no idea Lilly Pulitzer was getting a line at Target. I'M SO EXCITED! Making blog friends is the best, and I absolutely LOVE this story. That's so cute and ironic that y'all wore the same dress for your 20th birthdays unknowingly! If I make it to a Target in time (and can find something left in my size!) I will try to participate, but I will definitely be stopping by to see what looks everyone comes up with! Aw, how fun! The Lilly for Target line is so fun, can't wait to see everyone's outfits!